Discovery SVX, launched at the Frankfurt Motor Show 2017 , adds extreme all-terrain capability to the Special Vehicle Operations (SVO) product triangle. SVX will sit alongside the acclaimed Range Rover Sport SVR and Range Rover SVAutobiography, which are hallmarks for outstanding on-road performance and supreme luxury respectively. 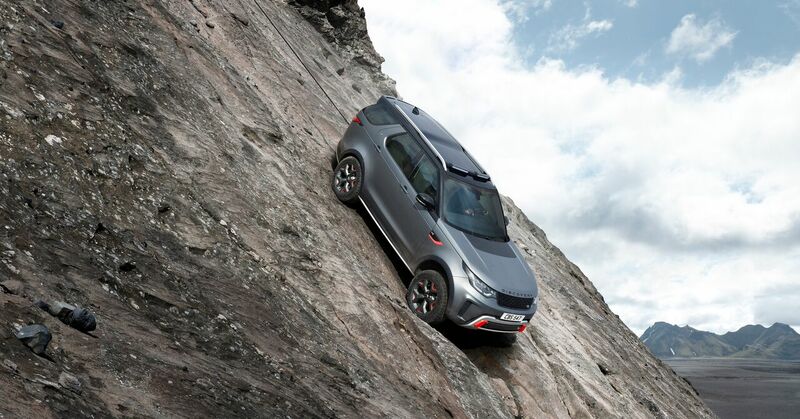 The SVX product line gives us a fantastic opportunity to deliver the ultimate Land Rover all-terrain capability in a dynamic and distinctive manner, creating a rugged and versatile SUV that the whole family will love: effortless, unstoppable and connected, whatever the terrain. “Discovery SVX is designed to reward off-road driving enthusiasts with the next level of all-terrain capability, without compromising comfort and practicality. Discovery SVX also stands out through its exclusive satin Tectonic Grey paint finish, a unique colour and material combination of Lunar and Light Oyster with Rush Orange accents inside, and ‘X’ logo perforations on the SVX-branded seats. Unique Narvik Black side vents with V8 badging, a Narvik Black Dynamic grille, Black roof rails and a roof-mounted unit with two additional light pods for improved low-light visibility complete the transformation.